Two of LA's top rival cops are going to have to work together. Even if it kills them. Tango & Cash is a 1989 American action-comedy film starring Sylvester Stallone, Kurt Russell, Teri Hatcher, and Jack Palance. It was directed by Andrei Konchalovsky although Albert Magnoli took over in the later stages of filming. The film describes the final episode in the struggle by LAPD narcotics detectives Ray Tango (Stallone) and Gabriel Cash (Russell) to thwart the plans of criminal mastermind Yves Perret (Palance) who frames them for murder. Ray Tango is a Los Angeles narcotics cop who dresses in fancy suits, wears wire-rim glasses, and talks to his stockbroker more than he talks to his mother. Gabriel Cash is a Los Angeles narcotics cop who has long, disheveled hair, and dresses in worn-out sweatshirts. 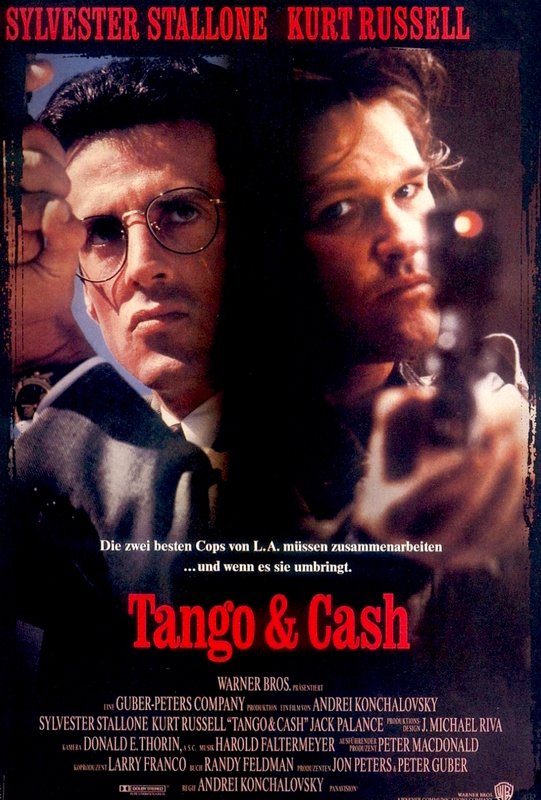 Even though they are rivals, Tango and Cash are the two best narcs in LA, which infuriates drug kingpin Yves Perret. Perret wants Tango and Cash out of the way, so Perret frames them for the murder of an undercover FBI agent. Perret’s plan is to have Tango and Cash killed in prison in order to avoid risking all-out war with the LAPD. Tango and Cash accept a plea bargain that will give them 18 months in a minimum-security prison, but Perret arranges for their destination to be diverted to a maximum security prison where Perret’s minions proceed to torture the pair. Tango and Cash are forced to work together to escape from the prison. After the escape, Tango and Cash set out to prove their innocence.